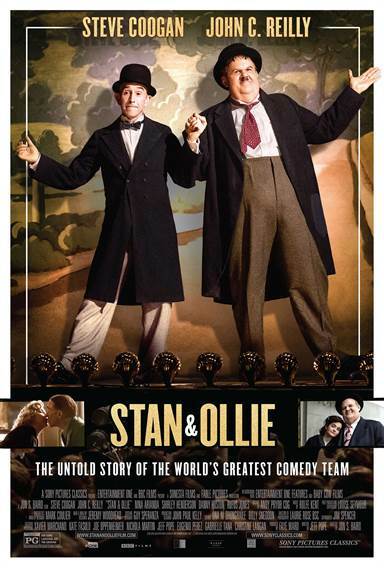 Download Stan & Ollie in Digital HD from the iTunes store. 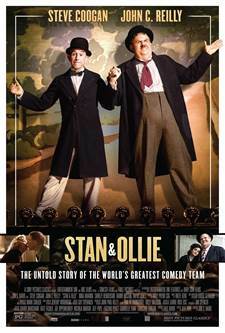 Stan & Ollie images are © Sony Pictures Classics. All Rights Reserved. Over the years the entertainment industry has given birth to some very beguilingly comedy duos. I'm sure you know some of them; they crop up every decade. Some disappear as quickly as they arrived, others leave behind them a vague memory, but a few brilliant ones leave behind an enduring legacy. Unless you've lived under a rock somewhere, you'll know instantly when the "coo coo" music theme begins, you're about to laugh at the misadventures of the little thin guy with perfect timing who constantly messes things up for the long-suffering big hulking guy. The team of Laurel and Hardy were quite simply magical. Through over 100 films the on-screen relationship of these two beloved buffoons has brought audiences huge laughter and melted hearts with their innate pathos. What no one ever saw though was the actual behind the scenes lives of the duo. The relationship that made up the hard work and long hours it took to make their antics look natural and hilarious. This sweet, gentle true tale about them successfully addresses that relationship, not at the height of their fame, but rather at the end of it, and it's drawn to perfection by the inspired performances of Steve Coogan and John C. Reilly. In 1953, Laurel (Coogan) and Hardy (Reilly) facing a fading future and problems of age and money are convinced to reconnect with their fans and entice a producer to make a new film, by touring variety halls in Britain. After a scary slow start, the show becomes a huge hit, however buried tensions threaten to destroy their life-long relationship. Director Jon S. Baird succeeded here in creating as genial and touching a portrait of these legendary comics as is humanly possible. My hat's off to him, he should be recognized for this work. However, as good as Baird is on this film, it pales in comparison to the amazing spot-on performances by Coogan and Reilly. Their seamless performances never for a moment betrayed the monumental effort it must have taken to bring their characters to totally believable life. The two actors weren't there, Stan and Ollie were. That's brilliance. Add to that some big laughs and some very touching moments and you have a very entertaining film that anyone can enjoy. My take… This is a wonderful film filled with humor, joy, triumph, pain, and the glory of friendship. It deserves to be seen and enjoyed. Don't miss it.